Delivery Methodology - Sunknowledge Services inc. Execution is our strength and we ensure superior service delivery through our six pillars of core operational functions encompassing every process and project. 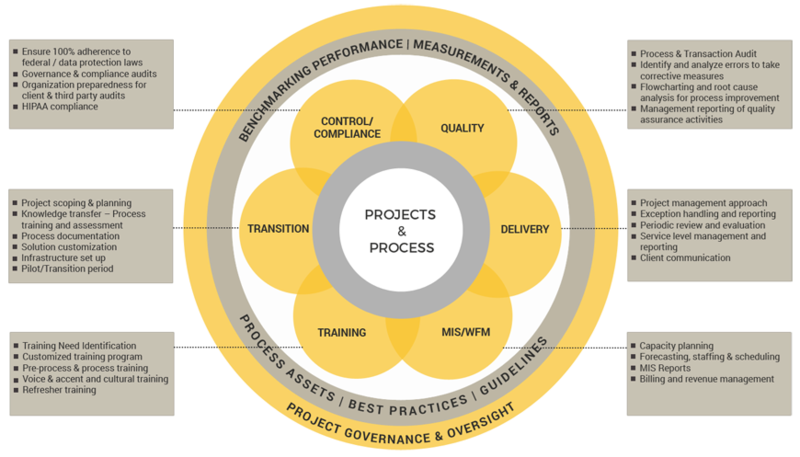 Project governance and oversight helps our management to keep a close eye on delivery of services and guide the team to deliver the best. Process benchmarking and performance measurements help us in continuous improvement and maintain operational excellence. We ensure successful delivery from the very beginning – right from the stage when we engage with our clients to understand their requirements and propose a cost effective solution to address their operational issues. Our transition process involves specialists from the process domain, technology and project management areas to ensure smooth transition of customer’s process and achieve steady state operation without any disruption of customer’s business. Our process management is supported by structured training, workforce management, quality control & assurance and compliance management to achieve predefined service levels. Being a healthcare service provider, we understand the importance of data privacy and security and comply with HIPAA-HiTECH requirements. Through 360o reporting we ensure that our operations are fully transparent to our clients. Our business services and operations are supported by a robust, scalable and standards-driven IT Infrastructure to support business continuity. With healthcare domain in mind, Sunknowledge Services Inc. has built a highly secure Information Systems environment which fully complies with HIPAA-HiTECH through implementation of information security management system (ISO 27001:2013) and industry accepted best practices. IT Infrastructure services delivered are both ‘fit-for-purpose’ and ‘fit-for-use’ to facilitate services within Sunknowledge Services Inc.’s operations. Our dedicated US Account Managers work, in close collaboration, with our clients’ staff, providing them with timely, inspiring and sustainable solutions.